The VIP Champions recognizes Chicago’s emerging entrepreneurs, innovators, celebrities and leaders who champion UNICEF’s mission for child protection and survival. These VIPs are truly saving lives with their commitment. Exclusive pin recognition during the event, along with private section, access to the 3rd & 4th-floor at ArtSpace8, Hollywood themed entertainment & trivia games, access to UNICEF Virtual Reality experience, access to the silent auction, live music from DJ Groove Animal, and many surprises. Additionally, all champions receive special recognition as a member of the VIP Champions at the event with individual mention and recognition on the event website. Limited availability. Can't attend but still want to support UNICEF? Please consider making a $25, $50 or even a $100 donation to benefit UNICEF's critical Emergency Relief Fund at a time when we are experiencing seven level three emergencies globally. Additionally, the EARLY BIRD ticket saves you $25 for 1 ticket! 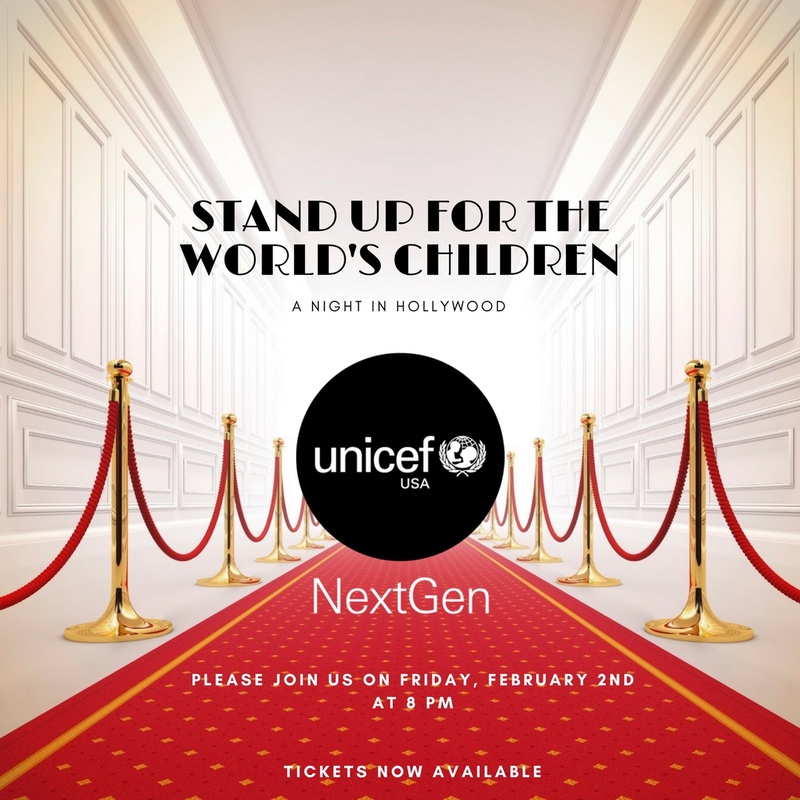 Stand Up for the World’s Children is UNICEF Next Generation Chicago's Winter 2018 premiere philanthropic event. Guests will be transported to a glamorous Hollywood evening held at ArtSpace8 in 900 N Michigan Shops while they listen to an inspirational program in celebration and support of UNICEF’s lifesaving work and women’s empowerment. The evening will include paparazzi style photography and videography, live music by Groove Animal, Hors-d'Oeuvres and an open bar. There will also be a UNICEF Virtual Reality experience, Hollywood themed entertainment & games, a silent auction, gift bags, and much more! Over 300 of Chicago's emerging leaders and philanthropists will be in attendance. This year's event aims to support UNICEF Next Generation's national campaign, launching the UNICEF pilot program for Syrian refugee women and newborns in Jordan, and supporting the UNICEF Emergency Relief Fund (ERF) currently providing life-saving interventions in seven level 3 emergencies in the Democratic Republic of the Congo, Iraq, Nigeria, South Sudan, Syria and surrounding territories, the Rohingya Refugee Crisis, and Yemen. Contributions to the ERF are donations which UNICEF allocates towards rapid, effective intervention when and where children need it most in any of the 190 countries and territories in which UNICEF works, helping save and improve the maximum number of young lives.